On June 14, 1777, the Continental Congress adopted a resolution to prepare a flag for our new republic. According to a well-known story, George Washington asked a Philadelphia seamstress named Betsy Ross to make a flag for our new country. Although there is no proof that this is the way our first flag came to be, Betsy Ross was a real person, and she was an official flag maker for the U.S. Navy. Each part of our flag has special meaning. The red stripes, which represent England, are separated by bands of white. There are 13 white bands, or stripes, representing the original 13 colonies, which separated from their mother country, England. The white stars, set in a blue background like the stars in heaven, symbolize each state in the Union. Over the years, the number of states has increased to 50, so each time a new state has been added, the number of stars has increased on the flag. The American flag is the only flag that has had a national anthem written about it. During the War of 1812, as he witnessed the British bombardment of Fort McHenry in 1814, Francis Scott Key penned the words of "The Star-Spangled Banner." 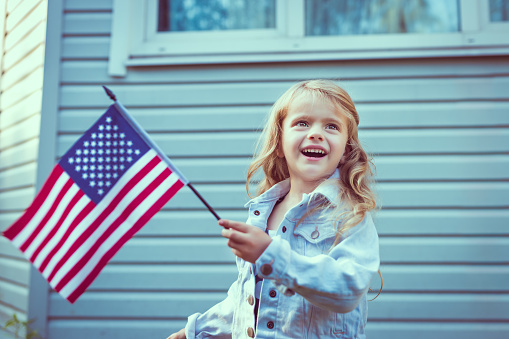 On the 100th birthday of the flag, June 14, 1877, the first Flag Day celebration occurred, but June 14 did not become an official national holiday until 1949. Now, Flag Day is celebrated yearly to honor our country's flag, the Stars and Stripes. To learn how to display our flag, go here. For more information on our country’s flag and its history, see our Flag Day booklist below.